Rainbow P-12 College prides itself on providing a diverse, engaging and challenging curriculum from P-12 level. At junior school level the students have access to specialist classes in Art, Science, Foods, Technology and Media. There is a Personal Learning curriculum from 7-10 which encourages students to develop an understanding of how they learn. 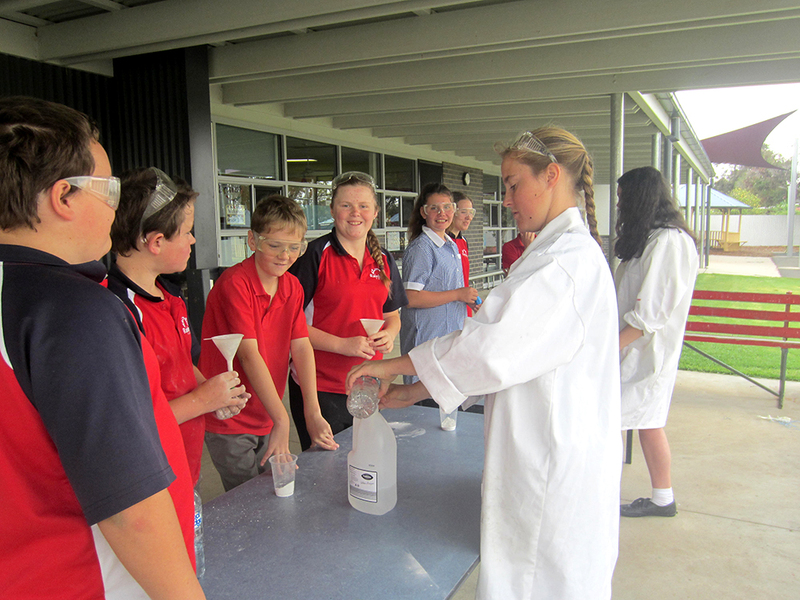 At Year 9/10 level there is an extensive electives program. We also offer alternative pathways via Hands on Learning (7-10), VET and VCAL. In the Junior School this year, we have implemented CAFÉ Reading. This involves Comprehension, Accuracy, Fluency and Expanding Vocabulary when reading. It’s a fun way for the students to remember reading strategies and to sustain read for longer periods of time. The students love the reading characters and have found a real passion for reading, using their new strategies. Reading Eggs is an on-line program that supports each child with their reading. It supports learning by offering individual lessons that allow children to progress at their own rate. The program has been developed by highly experienced educators and focuses on a core reading curriculum of phonics, spelling and sight words using strategies that promote reading success. The children enjoy using interactive animations, games, songs and rewards to motivate them and make learning to read enjoyable. Reading Express is an additional component of the program that caters for students from Prep to Grade 6 and focuses on building reading vocabulary, fluency and comprehension using books from a digital library. These programs are also accessible for families to use at home. In the junior school section of the College, students engage in a variety of learning tasks to extend their numeracy skills. They also use Mathletics to support learning within the classroom. Students access Mathletics Live to assist with the accuracy of their number fact recall. During this time they can compete against students from around the world or with students from their class or simply compete against the computer. They also engage in various curriculum-aligned Maths content and receive instant feedback which encourages independent learning. Developmental Play is based on rigorous research and theory. It looks at developing the whole child and provides opportunity for active learning from the world around them. It encourages language development, social skills, risk taking, problem solving, creativity and fine-motor skills as well as working towards improving literacy and numeracy skills. Developmental Play provides a range of opportunities for children to explore, investigate and engage in purposeful and meaningful experiences such as using a reading corner, writing activities, role-plays, dress-ups, interest tables, constructions, art, mathematics, science and sensory areas to name a few. It reinforces concepts and tasks being taught formally in the areas of literacy and numeracy in a more relaxed and enjoyable way. Students are asked to reflect on their learning to their peers and teacher. At 9/10 level students are provided with an electives program where they select 3 subjects to study each semester. Each subject has a three period allocation per week. Students can select from Ag & Hort, Art, Foods, Health Information Technology, LOTE(German), Media, Music, Science, Technology and Textiles depending on the staff available each semester. Rainbow P-12 College offers an extensive range of VCE subjects. The College uses the unique process of shaping the subject blockings on the basis of student choice. This allows for small classes that are tailored to meet the career paths of each individual student. If there is a chance that the College cannot offer the subject we ensure access to video-conferencing and distant education options. VCAL (Victorian Certificate of Applied Learning) is offered at Foundation, Intermediate and Senior levels and sits alongside VCE/Year 12 courses. Students who are enrolled in, or have completed their VET certificates can access this program. It provides a much more “hands on” approach to senior schooling. It includes a personal development unit as well as taking a project based approach to learning. Support groups are established to discuss the learning of the specific student. From these meetings an ILP is established and used as the basis for ongoing proactive discussions in subsequent meetings. MultiLit (Making Up for Lost Time in Literacy) is an intensive one-on-one literacy program for low progress readers. It focuses on accuracy in reading and spelling and uses such strategies as word attack skills, reinforced reading and sight words. The Levelled Literacy Intervention program is a small group supplementary intervention designed for students who find reading and writing difficult. The goal of the intervention is to bring the students to grade level achievement. It is a short term intervention that provides instruction in reading, writing, phonics and word study. It is based on the Fountas & Pinnell (F&P) Text Level Gradient and students are selected using the F&P benchmark testing program. Rainbow P-12 College has a commitment to the whole student, this includes not only their academic development but also their social and emotional growth. Rainbow P-12 has a variety of student wellbeing programs that combine to support our above commitment. The Achievement program is an overarching framework that provides rainbow P-12 with a structure for co-ordinating our approach to support health and wellbeing in our school community. The program is overseen by a wellbeing committee which is made up of representatives from the student body, parents, staff and the wider community. This is a package of professional learning, advice and support co-ordinated by Beyond Blue giving teachers the tools and information to support children and young people, from birth to 18 years of age, towards better mental health and wellbeing; so they grow up understanding there is no health without mental health. It provides Rainbow P-12 College with a cohesive and seamless approach to the mental health and wellbeing of our students. The Alannah and Madeline Foundation’s Better Buddies Framework is an initiative designed to create a friendly and caring junior school community where bullying is reduced. Through the program students in Prep/1 and 5/6 of the junior school buddy up and learn the values: caring for others, friendliness, respect, valuing differences, including others and responsibility via a number of activities during transition, at the start of the year and throughout the year. The highlight is always the very well catered for Teddy Bears picnic. Guys and Girls is a self-esteem program run by West Wimmera Health Service (WWHS) at Grade 5/6 level. The sessions include activities and discussions on; nutrition, exercise, friendship, bullying, body image, changing negative self-talk into positive self-talk and being an individual. The aim of the program is to develop a positive self-image “I always like being me”. The sessions run fortnightly for 14 weeks. Students may also be referred to DET Student Services for specialised support with speech pathology, counselling or for assessment of their learning needs.